Stanley Yacht Services: Announcing FREEDOM! 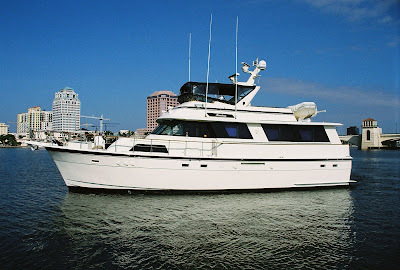 Stanley Yacht Services, Inc. proudly announces a new addition to its charter fleet! Built in the classic motoryacht tradition, Freedom is a well-appointed, four stateroom (including crew quarters) 61' Hatteras (1983 model) with updated features such as a walk-behind bar with wine cooler in the main salon, stainless steel appliances and Corian® countertops in the on-deck galley, custom lower level day-head, and a great flybridge with full seating, wet bar, and polished stainless grill. Currently undergoing a post-purchase refit, Freedom will feature all new and upgraded electronics, Flexiteek aft and flybridge decks, custom interior decor, and brand new bimini top and flybridge enclosure in classic Hatteras off-white, designed to increase visibility from the helm and provide a cooler, more enjoyable cruising experience on the upper deck. Freedom will be available for charter very soon and we encourage you to follow the progress of her refit on Twitter (@SYS_Freedom) while the separate Freedom Classic Yacht Charters website undergoes its own construction. In the interim, feel free to contact us with any questions and/or, of course, to make reservations! Special thanks to Wayne Cannava and everyone at Gilman Yachts of Fort Lauderdale for their excellent service and assistance with this endeavor.